For the last 18 months Matthew, Max and I have been working on completing our ABC Level 3 diploma in bespoke tailoring. 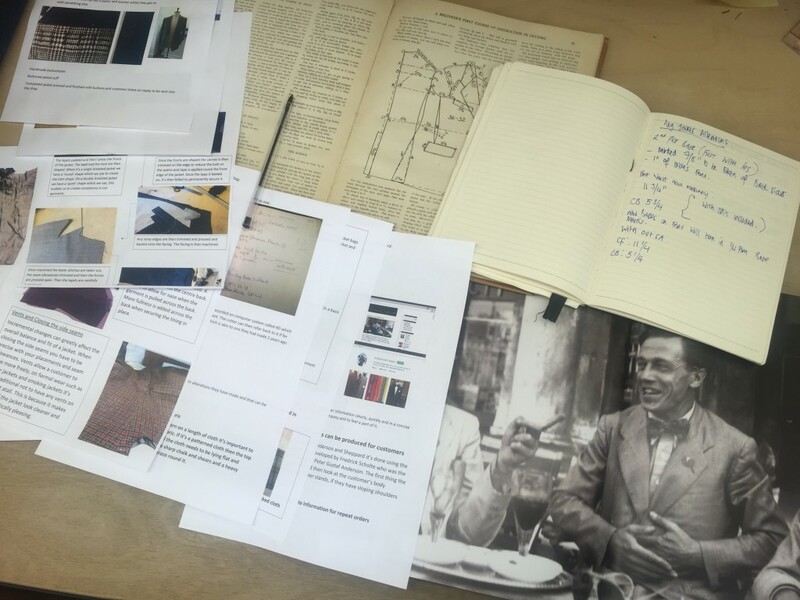 Unit one deals mainly with various working practices such as health and safety laws and regulations, work and employment legislations and also gaining an understanding of the contextual history of tailoring and Savile row. Unit two deals with the practical side of tailoring. The unit depends on what your training in, Matthew is an apprentice Trouser Cutter, Max is an apprentice Coat Cutter and I am a apprentice coat maker. My unit was focused on making a coat from conception to finished product. This involved learning the basic principles of cutting coats, research into the various styles and types of coats, their historical development, and gaining a proficient understanding of all the stages of making. Susan Fraser guided us through the course helping us gather evidence through voice recordings, written reports and practical observations. My favourite part of the course was definitely having the opportunity to research and quiz Leslie Haynes and Ollie Trenchard about cutting! Sue is now checking over our work to ensure everything is there and then our portfolios will be sent to an external moderator. I’m so excited its finished and that my work will be formally accredited. I’m so grateful to Sue Fraser for all her help and infinite patience with us!